Sony is rumoured to be launching a Nunchuck style add-on to its so-called 'Arc' motion control device for the PS3, with the possibility of a reveal at this week's Games Developer's Conference (GDC) in San Francisco. 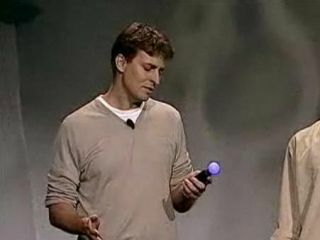 The latest PlayStation Arc rumours started, as many gaming tech scuttlebutt does, over on GAF, with a forum poster claiming to have seen recent "pictures" of "Wand/Nunchuk". The user, "ichinisan", says the add-on has an analog stick and X and O buttons and that the L1 and L2 shoulder buttons are underneath the D-Pad. He also says that the wand contains "one very big button on top"; with Sony's trademark facebuttons of X, O, Triangle and Square added on; and a trigger marked "T". If it is to be revealed, then we will no doubt hear lots more from Sony's GDC press event on Wednesday.